Tastes good along with sambar rice & curd rice..
Heat 25 g of ghee or 1/2 tablespoon oil. Add the cauliflower and cook over medium heat for 5mins. Using a spoon transfer the cauliflower to a bowl and pour the yogurt over the top. Add the remaining ghee or oil to the pan and heat it, add onions, garlic, salt,bay leaves and all the spices except chilli powder. Fry until onions are golden and soft, then stir in the chilli powder. Return the cauliflower and yogurt to the pan and stir to combine all the ingredients. Cook over low heat for 10mins. Pour in the measured hot water and simmer for 25mins or until the cauliflower is tender, stirring occasionally. This is good but not as good as you chicken or meat recipes. Thankx. 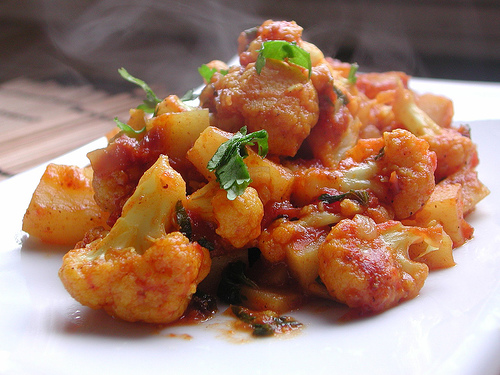 Sorry friends this is a pure vegetarian recipe.. You can garnish it with coriander leaves..